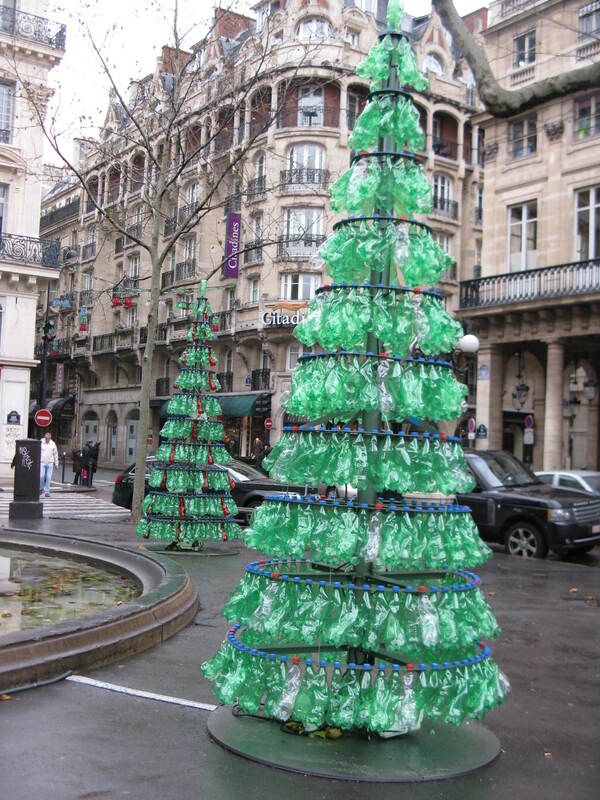 The city of Paris picks up trash daily and recycling twice a week with the schedule differing by arrondissement. In apartment buildings, the gardienne is typically responsible for taking the bins out to the street for pickup by the city crew. Your responsibility is to make sure that you separate trash from recycling and dispose of all your household waste properly. Solid green bins are for non-recyclable waste, with the exception of dangerous materials (such as toxic chemicals, needles, and batteries). Green bins with white lids are for recyclable glass items. Please note that mirrors, porcelain, pyrex and earthenware dishes and flower pots, windowpanes, and light bulbs are strictly prohibited. These items are non-recyclable and should be placed in the solid green bins. Corks and lids should be removed and placed in the solid green and yellow lid bins, respectively. 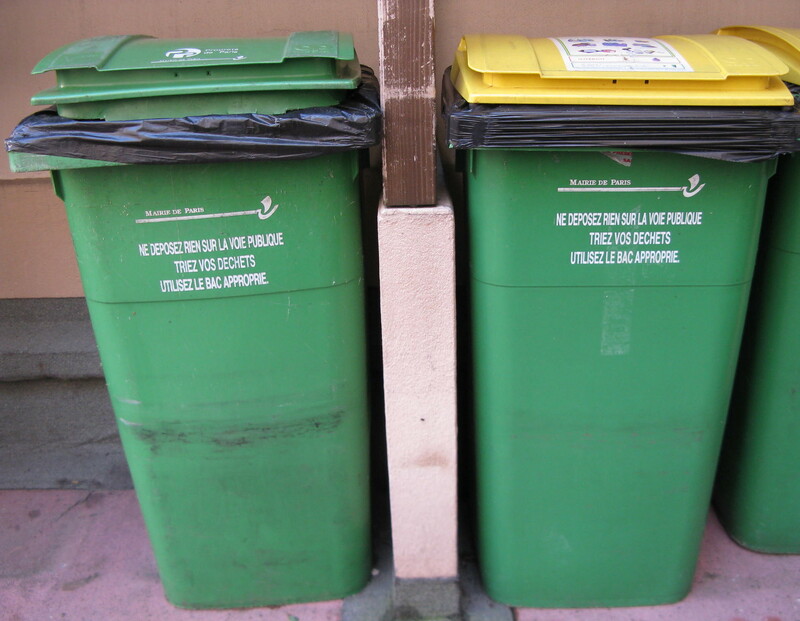 All other recyclable materials should be put in the green bins with yellow lids: paper, plastic, and metal. Products soiled with food (such as pizza boxes and juice cartons) plastic bags, magazines wrapped in plastic, wallpaper, and diapers are all non-recyclable. Please put these in solid green trash bins. Dangerous, toxic products such as medications and batteries can also be recycled fairly easily. For medications, needles, and syringes, contact your pharmacy who can either recycle them for you or point you in the right direction, depending on the item. Toxic paints and solvents, mercury, and other chemicals can be taken to waste reception centers (déchetteries) in the 13th, 15th, 18th, and 20th arrondissements, or can be picked up from your home by calling 01 43 61 57 36. Batteries can also be dropped off at the waste reception centers as well as in many supermarkets. For everything you need to know about recycling, visit the city of Paris Web site by clicking here. The city of Paris offers free curbside pick-up of bulky items such as furniture or electronics equipment. The service is generally offered twice each week with varying times for each area. For pick-up details in your area or to make an appointment on line, visit dechets.paris.fr or call 01 55 74 44 60 for direct information and scheduling. Note that it is against the law to place oversized items on the curb without preauthorization.